Scarlet pools only builds unique pools that have been designed with our customers’ one on one. After initial assessment of the property, our team will roll up our sleeves and get to work helping the homeowner pick out all of the design features available to them. These exciting and diverse pool design features can be seen on our Inground Concrete Pools page. Once the design basics have been set, we will get to work with a 3D visualization for the home owner to review with their service representative. The last step before the dig, will be to obtain all necessary permits for your Inground Concrete Pool and decking will be obtained by Scarlet Pools. Before digging our pool builders will layout form boards for the layout of your pool so that the dig takes place in the exact location set in the plans. After the location of the form boards are precisely placed, the fun part can start. The excavation is mostly dug using a small, skid-steer front end loader which helps provide precise digging. Also a smaller machine allows for easier maneuverability while digging out the pools shape. During the entire process of the pool build, we provide our own inspections by our team leaders and ownership to ensure the quality of the pool and that code is being met. Local inspectors for your county or city will also be on site from time to time to make sure code is met according to county or city code requirements. 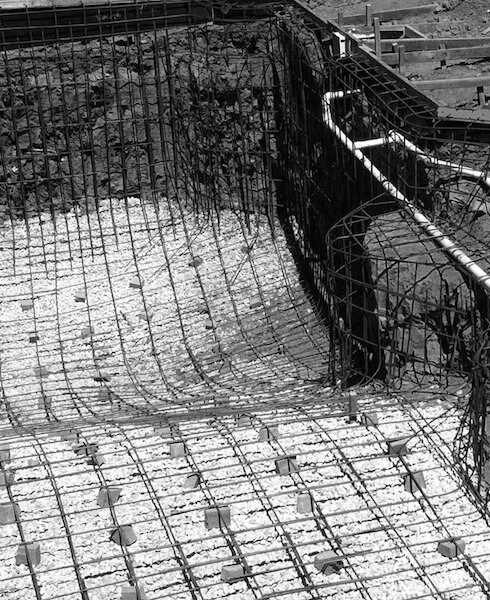 Rebar and Rock is placed for concrete support and to create the frame of your pool. Scarlet Pools is 100% in support of shooting using shotcrete. Our formulas for pool concrete is mixed and guaranteed by concrete factories and then brought premade to the site of pool construction. Our expert builders then shoot the high pressured premade concrete onto the rebar frame to create the pool shell. Check out the video to get take a look at this step of the build, pretty cool if you ask us. This is where the pool begins to take on a personality besides its unique shape. This is always exciting for a homeowner to get to see their dream come to life. Licensed technicians will provide plumbing and electric to the pool to provide safe and proper energy for your pool. All inground pools require decking to go around the pool. This has also been decided during the design process and the materials were picked out by our customers. The deck is done last to prevent any debris from contaminating the slip resistant coating. 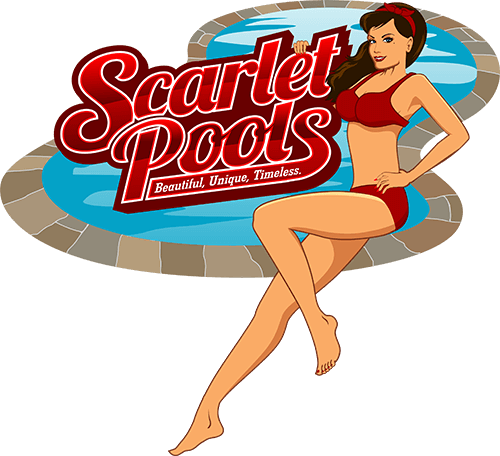 Scarlet Pools will help the customers with initial start up teaching them about proper chemicals, start up, and shut down. The best part though, is jumping in and swimming in your brand new inground concrete pool.